A report benchmarking the mobile networks in Australia has given high ratings to the country's three telco network operators. The report was released the same day the federal government released applications for a $100 million program that aims remedy poor mobile coverage in regional areas. “All three of Australia’s mobile networks are strong performers,” according to the <I>CommsDay</I> 2014 Mobile Benchmark, a report prepared by the telecom newsletter and consulting firm P3 Communications. The magazine praised Telstra's network, saying it “took the ‘best in test’ crown by a clear margin” in the study. Check out Computerworld Australia’s comparison of the three telcos’ 4G networks, 4G in Australia: The state of the nation. Telstra launched its 4G LTE network 10 months ahead of Optus, which was ranked an expected second, and has made large investments in its network, the report said. Telstra got high marks for reliability of both voice and data. The report said that 90 per cent of file downloads were faster than 6Mbps on 4G, and 90 per cent of uploads were faster than 3Mbps in metro areas. However, Telstra lost some points for “relatively long” call setup times. “Its consistent capability across voice, 4G and 3G is a testament to the investment and expertise it has dedicated to mobile,” it said. Optus received high ratings for reliability and performance of 4G data in metro areas. However, outside major metro areas Optus' network was rated less highly for YouTube and the 3G network, the report found. Optus also scored lower than rivals on speech quality, though reliability was high and the report noted that Optus is the only operator without HD voice. While Vodafone came in third, the reported noted that the beleaguered telco has greatly improved since the major network issues it suffered in 2009 and 2010. “Back then, it struggled to meet the capacity and coverage demands of the growing smartphone boom. But the firm spent billions in some serious network upgrades across the following years, and that has shown through in the 2014 test results,” the report said. The report found Vodafone’s 4G LTE to be fast but less reliable than the other networks. Similarly, the 3G network had high throughput speeds — 90 per cent of the download tests were faster than 3Mbps — but the network suffered low success ratios for YouTube sessions, the report said. 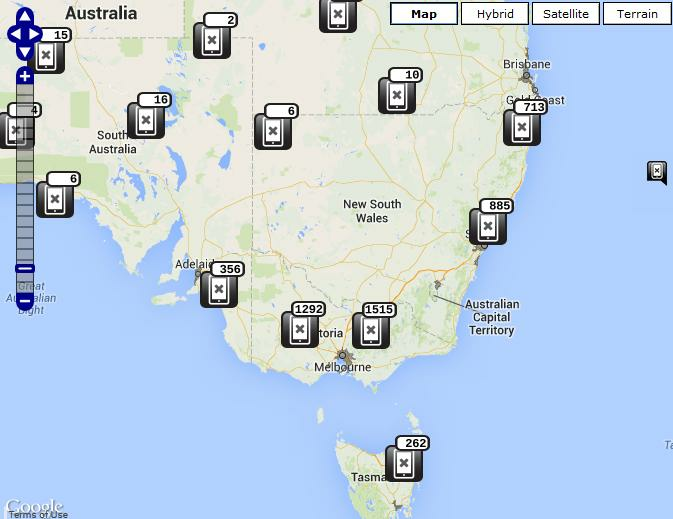 Despite the telcos’ efforts, many areas of Australia still have poor or non-existent mobile coverage, according to a map of mobile black spots released by the Department of Communications. The Department posted a map of 6000 unique mobile black spot locations across the country. 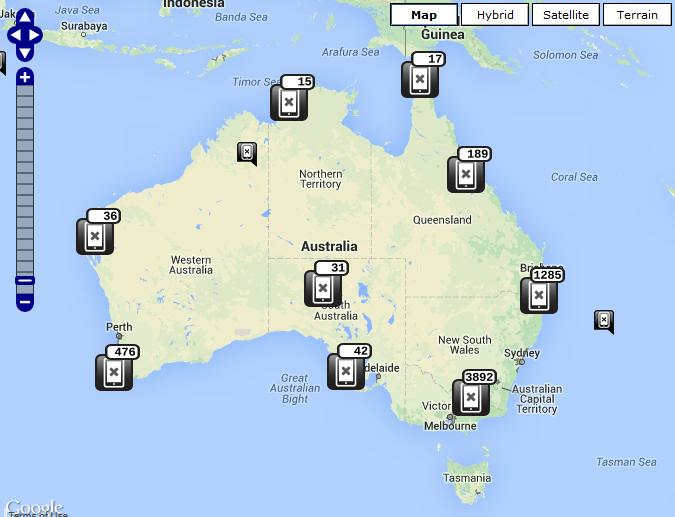 Nearly half of the 6000 black spots identified on the Department of Communications map are located in Victoria. The southeast of the country, including the regions around Sydney, Melbourne, Canberra and Adelaide, represented about two-thirds of all the black spots. The areas were nominated by individuals, organisations, community groups, governments and federal members of Parliament. 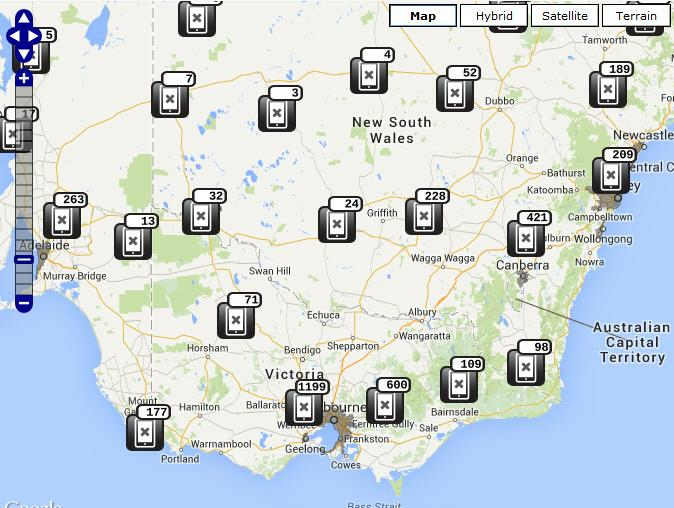 The department has said that its $100 million Mobile Black Spot program will not be able to patch all 6000 locations. The program’s director, Phillip Smurthwaite, last month predicted the program will produce 250 to 300 new base stations, with each tower able to cover between one and 16 of the identified black spots. Smurthwaite has said the program will prioritise small communities and major transport routes for new mobile base stations in regional Australia. It also helps if the area puts a little “skin in the game,” including cash or other assistance to build the base station, he has said. The Victorian government has already put forward large sums of money to the program. The state government has a $40 million program, with some of the money for Wi-Fi on trains and the rest for mobile black spots. The Western Australian government also has a $40 million black spots program. Slightly more than 500 black spots were identified in WA, representing about 10 per cent of the total number of locations.